The Group will arrive at the Miami Yacht Show with a majestic fleet of 15 boats, including two fantastic American premières: Riva 100’ Corsaro and Riva 66′ Ribelle. 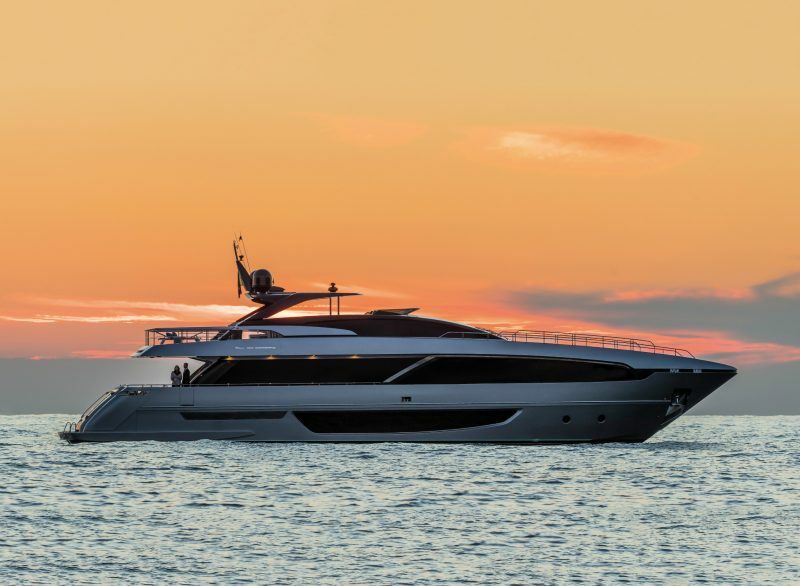 Ferretti Group will present in Miami, in absolute preview for the American market, Riva 66’ Ribelle, the new sport-fly that commanded the Cannes Yachting Festival and Boot Düsseldorf 2019, and Riva 100′ Corsaro, the first model of the Riva flybridge range, together with Riva 110’ Dolcevita and Riva 90′ Argo. • Ferretti Yachts 450, Ferretti Yachts 670, Ferretti Yachts 850 and Ferretti Yachts 920. • Rivamare, Riva 56’ Rivale, Riva 76’ Perseo and Riva 88’ Florida. • Pershing 5X and Pershing 9X, masterpieces of the ‘X Generation’ range, Pershing 70 and Pershing 82. • Navetta 33 Custom Line. at Island Gardens Deep Harbour Marina, the second location for the Miami Yacht Show, on Watson Island. Newly added to the show for 2019, Island Gardens can host yachts up to 400 feet. Also at the Miami Yacht Show, Ferretti Group renews its collaboration with Italian and international luxury brands. The Italian winery La Scolca offers an excellent wine selection; Pommery, provides guests with a fine selection of champagne; Seabob exhibits its limited edition sea toys; Mr. C Coconut Grove, due to open their doors in March, joins us daily from 4pm until 6pm (3pm until 5pm on Monday), offering guests their Bellini signature drink; Luxury Living, handles the interior design of the Custom Line Navetta 33 on display with Frette, which handles the owner’s cabin décor; the private jet company Fontainebleau Aviation; Ferretti Group’s historic partner Poltrona Frau; and Slam, supplier of Ferretti Group crew uniforms. Successor to many legendary Riva yachts, 100’ Corsaro is the perfect blend of comfort, performance, style and safety. Its majestic dimensions are arranged harmoniously with the athleticism of the design, characterized by a sharp profile, metallic colors in dark tones and large glass surfaces. 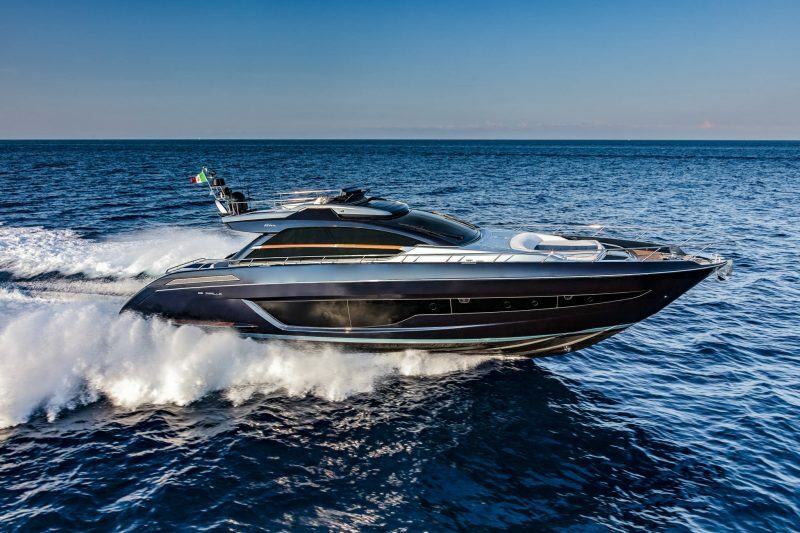 The Riva 100′ Corsaro is born from the collaboration between Officina Italiana Design, the atelier founded and headed by Mauro Micheli and Sergio Beretta, exclusive designers for the entire Riva fleet, and the Strategic Product Committee led by Mr. Piero Ferrari and the Ferretti Group Engineering Department. 66’ Ribelle, the flagship of the Sarnico shipyard, continues the evolutionary path that began with 56’ Rivale. Conceived as an entry level model in Riva’s sportfly range, it aims to become the new benchmark in its market segment. Born through a collaboration between Officina Italiana Design, the atelier founded and headed by Mauro Micheli and Sergio Beretta, the Product Strategy Committee led by Mr. Piero Ferrari and the Ferretti Group Engineering Department, 66’ Ribelle sets a new standard of excellence in combining style with functionality and beauty with technology.